The true story of a pitcher who wanted more from himself and refused to give up. Years later, he was finally forced to hang up his cleats. The next morning, Dan looked in the mirror and didn’t recognize the man peering back. If no longer a ballplayer…what would he do? What had been the point of all of it? Who was he? 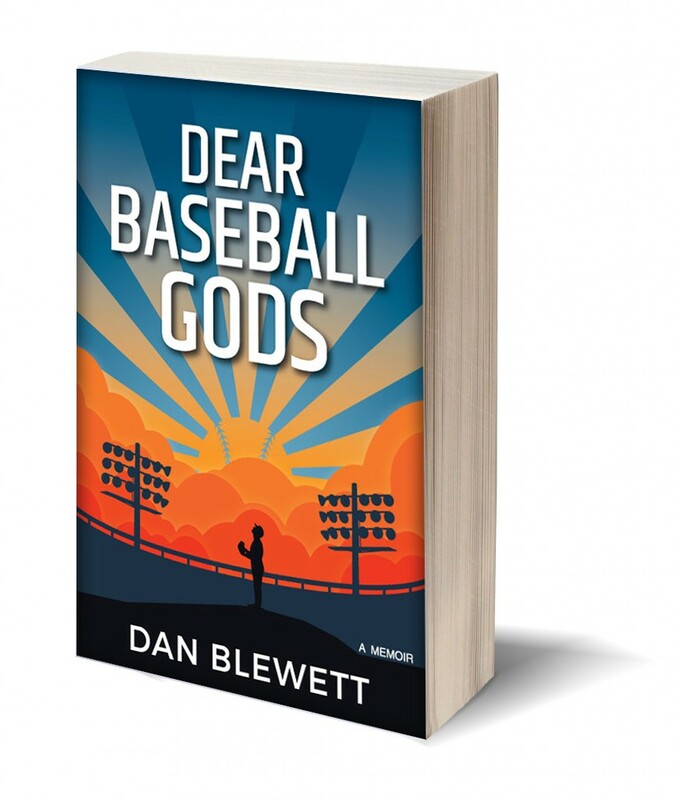 In this philosophical memoir by former pro baseball player Dan Blewett, you’ll find out that the pinstripes don’t wash off so easily. …maybe that was the point. It was June 27, 2012 and I was in Rockford, Illinois. It was one of those days when the sun was impossibly high in the sky, taunting us with its inescapable rays. I always believed I would know when it was time to walk away from the game, that my inner monologue would spell it out like the Times Square ticker tape. Seeking relief from the sun, I sat cross-legged in the shade of what looked like a Christmas tree, inexplicably planted in the middle of an open field. I peered down at the wispy green grass, darkened as it too enjoyed a reprieve from the oppressive heat. Is this really it? Is this the end? Is it really my time? As I pondered my fate, I surveyed the fractured pieces of my baseball career, scattered around me like shards of glass. With too many to count and without any glue, my disappointment turned into sobbing. My sunglasses fogged, the rushing wind not enough to dry them. A month ago, the end was impossibly far off. It couldn’t possibly be here by now…could it? “Well…what’s up?” Andrew asked. He definitely had never seen or heard me cry. As I attempted to respond, the words remained stuck in my throat — uttering them would make it even more real. Get it together. You’re tougher than this…aren’t you? My eyes welled up and spilled over as I held my gray flip-phone to my ear, waiting for the composure to reply. Andrew was my best friend, one of a handful of people who had wished me well and shoved me off to sea when I signed my first pro baseball contract. I told them I wasn’t coming home for a long, long time. The news had come moments prior during batting practice. I had been awaiting the results of my MRI, and the doctor finally got ahold of Liz, our athletic trainer. Liz and I were close — she had taken care of me that season in the training room, trying in vain to keep me on the field. I repaid her with snarky jokes that connected with her dark sense of humor. While I was out shagging BP with the other pitchers, she called me over to the dugout, this time with an expressionless face I rarely saw. “The Doctor is on the phone. He wants to talk to you.” I sat down on the wooden dugout bench and took the call. “Hi Dan. Thanks for speaking with me.” He told me his name but I immediately forgot it. I listened, watching as our infielders cautiously fielded ground balls. The field had been baking in the sun and was, to put it lightly, rough. Balls were taking fast, unpredictable, aggressive hops and the grass was parched, starting to brown ever so slightly. I was hot and thirsty; everything — myself included — was overcooked. “Dan, it was hard to read your MRI. To be perfectly honest, I’ve never read the MRI of a pitcher who’s had a prior UCL reconstruction.” Reconstruction of the ulnar collateral ligament , or UCL, is better known as Tommy John Surgery, eponymously named after the first player to receive it — Yankees pitcher Tommy John. The pioneering Dr. Frank Jobe subsequently saved thousands of pitchers’ careers with the procedure after Mr. John first agreed to be his crash test dummy. Hurlers were reborn thanks to Dr. Jobe, myself included. I had already undergone the procedure once, four years prior, in 2008. I was told I would never need it again. Ordinarily, I didn’t trust doctors from small towns and Evansville, Indiana was a small town. But this orthopedic surgeon — who I hadn’t and never did end up meeting in person — was articulate and deliberate in his choice of words. He projected a voice that felt both empathic and kind; I trusted him. He hadn’t just glanced at my MRI — I got the impression that he searched it like a maze, trying to find a way out for me. And I could tell that he was disappointed that he hadn’t. I thanked him for the call and handed the phone back to Liz. I took a deep breath and walked back out to left field. This was my year. My first seven starts of the season couldn’t have gone better by any metric. I was leading the league with a 1.06 earned run average (ERA) along with a number of other pitching statistics. I had struck out 51 batters in 42 innings and was only giving up an average of three hits per outing. I was proud to be considered the Ace of the Evansville Otters pitching staff, the first time in pro ball I’d earned such a distinction. In my second start, when I took a no-hitter through to the eighth inning, it was clear that the work I’d put in the previous offseason had paid off. My mind and body were in harmony as I executed game plans each night with an aggressive confidence. Soon enough, I would no longer be a lowly Independent League player, and I could brush that pesky chip off my shoulder. I began seeing MLB scouts in the stands, radar guns fixed on me. It was a season of redemption and newfound confidence. And with one phone call, it was all for nothing. Andrew and I were best friends in preschool. When we graduated, however, we enrolled in different elementary schools and I didn’t see him again after that. Later on, we only knew we were friends because our moms told us so. We moved on and lived separate lives…or so we thought. Over a decade later, I found myself sitting in a classroom on the top floor of the University of Maryland-Baltimore County athletic center, waiting for orientation to start. It was the first official day for me as a Division-I baseball player. Our coach took role, rattling off names from his list of thirty or so players. Finally, he got to mine. A guy in the front row cocked his head around, as if he was confused to hear my name. “Do you know that we used to be best friends as kids?” He remembered. Andrew is 5’10 with a wide back and a slight bow in his legs. Projecting a calm energy, I always found myself a little shocked at how quick he was when he’d take off into a sprint. I’m two inches taller but he takes the crown as the better athlete. He’s also more socially adept, in part because he’d jump right into a pick-up basketball or football game and make friends through competition. I never cared much for other sports — pick-up or organized — and tended to keep to myself in my free time. I always needed a bit longer before becoming “one of the guys,” and I’ll admit that I’m still not great at it. We decided to be roommates sophomore year and were assigned to a quad in a nice new dorm building. The connection we had as little kids apparently endured through 13 years of separation, leading us both to excel at baseball. We lived eerily similar lives in a silent parallel. Just to cap off the weird coincidences, I was a pitcher and he was a catcher, which meant we’d be working together as battery mates on the field. What always united us, though, was our similar overall affect — sitting around, we could be perfectly content to not say a word, neither of us feeling awkward or anxious about it. Andrew transferred a semester later. Playing time was in short supply and he didn’t see eye to eye with the coaching staff. He ended up finding a good fit at Frostburg State, a school up in the mountains near both the Pennsylvania and West Virginia borders. We talked only occasionally, seeing each other during winter and summer break. We could go six months without a word, yet pick right back up like we’d seen each other yesterday. Nothing had changed. Years later, when I had my first contract in hand, he was there to help send me off. I made my debut a month after that and it meant everything to me. It was a combination of a million emotions — excitement, terror, nervousness and elation. I had done it. When the game ended, I went out for pizza with my parents and my host family. As we waited for our two large pies, I got a call. It was Andrew. “Thanks, man.” There was a unique inflection in his voice, a tone of pride and excitement that I had never heard from him before. His voice was different. He called me at the beginning. I called him at what might have been the end. The four-year anniversary of my first Tommy John surgery was just a few months away. That day — August 25, 2008 — marked the end of my collegiate career. It’s a simple, quick procedure in which the doctor first removes a tendon from a small, vestigial muscle in the forearm. Then, holes are drilled through two bones — the ulna (inside of the forearm) and humerus (upper arm), after which the tendon is pulled through the bone tunnels. Once weaved through in a figure-eight configuration, the tendon is stitched and anchored, once again linking the two bones together. If all goes well, the tendon heals just as well as the native tissue that snapped under the strain and stress of bases-loaded jams, long toss sessions and high pitch-counts. I had never worried about my first surgery failing. I had one of the nation’s best surgeons, had been diligent with my rehab, took care of my body and did everything in my power to stay healthy. Yet here I was — nearly four years later — on the sidelines yet again submitting to an arm that no longer worked. Since spring training, my fastball — a heavy four-seamer that sat at 91–94 miles per hour — had been dipping into the 87s by the third inning. My control slipped from good to average to poor. All of a sudden, I was walking six batters per nine innings — an abysmal doubling of the acceptable rate of three batters per nine. The version of myself that was blooming — about to get signed and do great things — was rapidly peeling away. I attempted to manage my arm troubles by not throwing between starts, thinking that I could get ahead of what we thought was severe tendinitis. A cortisone shot from a different team doctor provided a temporary masking effect, but eventually wore off. What was revealed — beneath the worn-off medication — was a season-ending injury. As I sat by that tree I thought back to the words imparted to me by one of my mentors, Coach Fred Cantor. He was my strength coach in college, and built me from a kid who had never touched a barbell into a force in the weight room. Coach, a heavyset, balding former football lineman who was about as wide as he was tall, was hard on me. He had a quick wit, making jokes and snapping about technique corrections that were too lightning fast for anyone to respond to. At times he was unrelenting, singling me out from across the weight room to “GET IT RIGHT, BLEW-IT!” while seemingly ignoring everyone else. He broke me down but would build me up just before I hit my breaking point. It was a cycle that repeated for years, and I became tough, coachable and resilient because of it. I later realized that he singled me out because he saw something in me, and wouldn’t let me slip through the cracks. I thought back to the time in college when I stood sheepishly in his doorway, hoping to avoid a conversation about how I’d blown a huge chance to earn a bigger role on the team. It was my sophomore year as I stood outside his office, leaning against the door frame in my heather gray UMBC t-shirt and black mesh shorts. I looked down, watching my hard work pool, circle, then slowly flow down the weight room floor drain. “Yes.” I looked at him, expressionless, hoping I’d be shooed away as quickly as I was summoned. “It didn’t go well,” I said. “I was supposed to go four innings but didn’t make it out of the second.” I chose not to elaborate further and turned my gaze back to my shoes. Ordinarily, a gap in conversation meant he’d fire off some joke at my expense. “With what you’ve done and your desire, I think the final chapters are yet to be written.” He paused as I looked him in the eyes, taking in a deep sincerity that I rarely saw. “I believe you’ll come back from this. I really do.” I nodded ever-so-slightly, glanced down at my strength program and walked out to begin my workout. I had writing to do. Sitting in the shade of that tree in Rockford, I hung up with Andrew and called my parents to break the news. My parents were equally crushed by it as I hung up the phone for the final time that day. I was now alone and needed to do what I always did: sort things out in the silent confines of my head. I closed my eyes, hoping maybe I’d get lucky and open them to find out it was all merely a nightmare. I then thought back to Coach Cantor’s words. I repeated them in my head: The final chapters are yet to be written. The final chapters are yet to be written. MY final chapters are yet to be written. I opened my eyes; I was still beside that tree, still rooted in a horrible reality. I reached to my back pocket and tucked Coach’s words neatly inside; they’d be needed someday soon. I checked my phone for the time and realized I couldn’t go back into the clubhouse looking like I’d been crying. Guys would perhaps understand, but nonetheless it wasn’t my intention to show weakness in front of them. It was 90+ degrees and blindingly sunny, so I decided a good sweat would cover up my lack of composure. Rain and sweat could mask pretty much anything. Then, I turned my palms up and looked at them, inspecting the callouses and fold lines. I had uneven gaps between my fingers from years accommodating a unique changeup grip, with thick yellow callouses resting beneath from nearly a decade of picking up heavy barbells. I’d done a lot with those hands in the last eight years; they’d served me well. I finally closed them — gathering up my destiny into my fists — and got up from beside that tree. I put my headphones in and jogged off, down a dusty back road that cut deep into open farmland. As I jogged, trying to make sense of it all, I wondered where you — the Baseball Gods — were at a time like this. You were supposed to protect a guy like me, saving a little magic in case one of their humble servants needed it. You could have helped the doctor find me an alternate route out of that maze of an MRI. I had been a pious disciple. I deserved better. Where is my good luck? When do I get a break? Why is it always me and never someone else? A second Tommy John!? That doesn’t happen to anybody! I swatted at the air in anger as I ran. I had been diligent. I had waited my turn. I had paid my dues and played the game the right way. I had scratched and clawed to earn playing time, suffered in the weight room, pushed through numerous little injuries and finally a surgery, then gritted through two hard years of pro baseball. This year was my year. It was all coming together. I was a leader, not just on my own team but in the league as a whole. This wasn’t fair. Why did you abandon me? I had turned 26 in December and did the math. I would be 28 before I returned to professional baseball. 26 was already too old to not be in Triple-A or the Big Leagues. I had tools — an above-average fastball, a sharp, power curve and a changeup that had heavy sink and arm-side run. I had the requisite ability, was learning to pitch and hitting my stride. I only needed an opportunity, but I kept hitting speed bumps. And now, here was this roadblock, an impasse that few found navigable. As I jogged deeper through the middle of nowhere, grain silos in the distance, a new voice began speaking up. Stop complaining. Stop whining. It’s done. It’s over. It’s happening no matter how much you want to whine about it. You can moan and cry or you can do what needs to be done. It’s NOT your time. You know better. Life isn’t fair…you’re tougher than this, aren’t you!? What happened to my arm simply happened and there was no finger to point. No one owed me anything. Maybe I had a defect in my arm, my mechanics, my pitching style — I didn’t know. Regardless, I hadn’t made it a habit of complaining about things beyond my control, so I certainly didn’t need to start now. I berated myself a little bit more before acknowledging that making the best of it was all I could do. I was going forward — not backward. A half hour into my jog, I remembered that I hated jogging and slowed to a walk. My navy batting practice shirt was stuck to me, my earbuds fell out repeatedly, and I had built up enough sweat 20 minutes ago. I thought about Forrest Gump and the pain that turned him into a bearded, long-distance machine. Unlike Forrest, I wasn’t running from my problems; I was running toward something — clarity. I can do this. I believe in myself. I repeated it a few times as I started to run again, passing the barns and cornfields I had seen on the way out. The 50-foot lights from the stadium were only a half a mile away now, and I had to return with a conclusion and some semblance of composure that I could wear the rest of the night. Two more years on the bench awaited when all I wanted to do was go play. But after purging some anger — shouting into the wind as loudly as I could — I was done. I was done feeling sorry for myself (well, mostly), and I was done whining. I was done sobbing and I was done looking at a glass half-empty. Sure, there was not a drop of water in the glass at all, but it had been pretty darned full the last few years, even with setbacks and hard times. I started thinking about what would come next. Maybe something good could come of it…maybe. I finished the homestretch as my feet burned with fresh blisters. It was nearing game time, and players were streaming out of the clubhouse as I approached. I was no longer a part of them, no longer had a game to hustle off to, no longer ran with the herd on the rocky path up the mountain to the Big Leagues. Somehow, though, I’d catch up. I stalled a while outside, wandering off as I monitored the flow of uniformed athletes. Finally, ten minutes before game time, my chance came — I slipped in and sat down in our detached clubhouse. Clubhouses are supposed to be underground, connected to the dugout via tunnel. This one, though, was little more than a glorified trailer located way out beyond right field, beyond the stadium. Since I had been on the disabled list for a week, I was used to not having any real obligations and had settled on taking a personal day. Each game, two pitchers sat in the stands behind home plate; one did the radar chart and the other the game chart. I enjoyed sitting in the stands in plain clothes and getting the straight-on view of each at-bat. From that point of view, it was easy to assess hitter tendencies, pitching strategy and umpire competence. I was also away from the griping and negative emotion that was always present in the dugout. The team had been playing sloppy baseball of late, and there was currently an overabundance of negativity. I was going to be late to the game, that much I knew. It was hot out, so if I didn’t sit and cool off for at least 15 minutes before showering, I’d be sweaty again in no time. I only brought one set of attractive street clothes per road trip, so a fresh coat of post-shower sweat wouldn’t wear well if I sat in the stands in my jeans and polo. I wasn’t sure what I wanted to do. Would I sit in the stands in street clothes with the rest of the spectators? Or, would I uniform up and spend my night in the dugout? While I air-dried in my towel, contemplating what seemed like a trivial decision, it dawned on me that my choice was perhaps bigger — a metaphor for my journey ahead. Would my future be watching baseball from the stands? Or would it be competing alongside my teammates in the dugout? I could say that I was too old, too fragile and too tired. I could say that I’d given it my all and that I just wasn’t lucky enough. I could say that I’d been through the rehab once before, and the road ahead was just too long to travel a second time. No one would argue. Or, I could get the surgery, grind it out, force down the jagged pill and rebuild myself one more time. Tossing my towel aside, I made my choice. I pulled on my compression shorts, then my navy-blue socks. I took the gray baseball pants down off the hanger and stepped in one leg at a time. I rolled up the bottoms until they wouldn’t roll up any higher, which stretched and flared the leg openings, helping the pant cuffs to fit better over my shoes. I threaded the navy belt through each loop as I grabbed my maroon practice shirt and pulled it over my head. After partially zipping my pants so they wouldn’t fall down, I removed my grey road jersey from the hanger, EVANSVILLE stitched on the front in navy blue with maroon trim. I pulled it over my head and shook out the shoulders, adjusting until it hung just right. I zipped up and buttoned up, sprayed my loosely-tied turf shoes with Scrubbing Bubbles, wiped them down and put on my cap. I walked over to the mirror and looked myself in the eye. 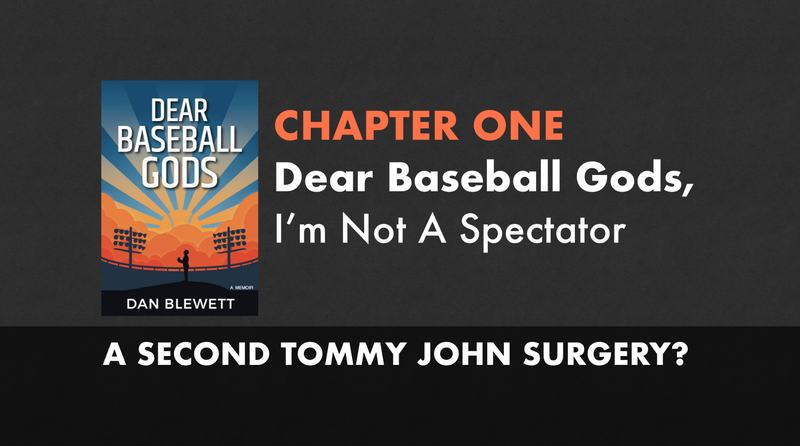 Buy Your Copy of Dear Baseball Gods now! Order your copy now and save with special pre-order pricing. Available on paperback, kindle ebook and audiobook.